First off, for those reading outside of Michigan, it’s supposed to be in the 80’s throughout the Mitten this week. Yes, spring doesn’t officially start until tomorrow. It was beautiful weekend for parades, grilling, and getting out the golf clubs and baseball mitts. St. Patrick’s Day –I’ve got to hand it to Grand Rapids Saturday for the St. Patrick’s Day festivities downtown. No, it didn’t quite meet what I’ve experience in Old Town Alexandria or Boston (haven’t been to Chicago or New York for St. Paddies), but I was still impressed. Thousands of green clad revelers filled downtown GR beginning at 7AM. The Irish on Ionia festival featuring a handful of bars, closed streets, and tents set up in the Heartside District next to Van Andel Arena sold out and welcomed over 6000 patrons. It’s a great year for the “drinking” holidays as both St. Patrick’s Day and Cinco de Mayo fall on Saturdays in 2012. Room for Improvement: To be honest, I haven’t gone through all of the study’s parameters and how they came to their rankings, but the State of Michigan receiving an F grade and finishing 43 out of 50 for government transparency still leaves a lot to be desired. Michigan Political News: I covered Governor Snyder’s Consent Agreement proposal for Detroit last week, but also making headlines was Snyder’s signing a new law that prohibits school district from collecting union dues through payroll deductions. It has been one more move in the looming union war that threatens to engulf the state in the near future. Eventually I’m going to tackle the pending “right-to-work” v. “right to collective bargain” war, but I’ve got to find the right time and whether it’s best to tackle the issue all riled up or clear headed. MLive pulled some fun reader comments. I think the last comment is most spot on. March Madness: Yes, ladies and gentlemen March Madness is underway. I must apologize for not posting a NCAA Tournament preview last week, but then again, if you were interested, you probably had no shortage of those. 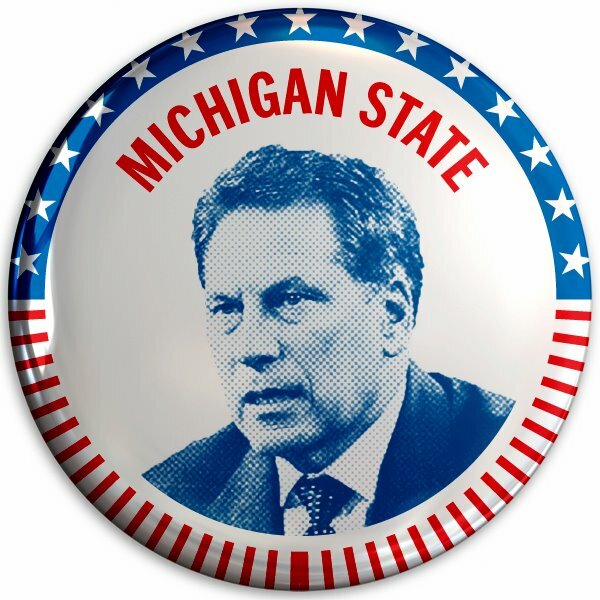 The state of Michigan had three teams in the Big Dance this year: University of Detroit, Michigan, and Michigan State. UofD couldn’t quite hang with Big 12 Champs Kansas Friday night, but with Ray McCollum Jr. they have a good shot to be dancing again next year and make a run. Wolverines are certainly disappointed with their early round exit to the Ohio Bobcats (the other “that Ohio school”), but it was still a remarkably successful season for the Wolverines who capture a share of their first Big Ten title since the Reagan administration. UofM was too reliant on the three pointer and the cliché “live by the three, die by the three” wouldn’t be a cliché without merit. Wolverine fans should be optimistic that some inside scoring is on the way in next year’s top ten recruiting class featuring 6-10 Mitch McCleary and 6-7 Glenn Robinson III. Coach John Beilein has the Wolverines headed in the right direction and has the support of the athletic department that has invested in upgrading the basketball program facilities. Finally, the Michigan State Spartans advanced to their tenth Sweet Sixteen appearance under head coach Tom Izzo. Izzo’s tournament experience combined with the leadership and versatility of Big Ten Player of the Year Draymond Green should lead the Spartans to another Final Four in New Orleans. Along with Green, the Spartans have a dominant two-headed low post players Derrick Nix and Adrien Payne and the outside shooting and scoring from Austin Thornton and Brandon Wood. The key for the Spartans is sophomore point guard Keith Appling. Saint Louis played way off of Appling on Sunday and dared him to shoot from outside. Appling responded with 19 points for the Spartans including a huge three with just over 90 seconds remaining, but he still did not appear confident in his outside shot. Appling will be relied upon to help break Louisville’s full court pressure, but he’ll also need to knock down some outside jumpers for the Spartans to continue to advance. A great shooter last year and in high school, Appling needs to regain his confidence.